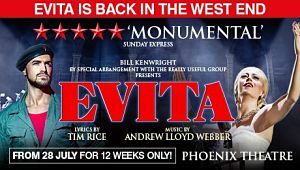 Tim Rice and Andrew Lloyd Webber's musical Evita is to return to the West End this summer opening at the Phoenix Theatre from 28th July for 12 weeks to 14th October. It will follow Gary Barlow's musical The Girls which ends its run at there on 15th July. The Bill Kenwright production is currently on tour starring Emma Hatton in the lead role of Eva Perón. Her previous theatre credits include Elphaba in the West End production of Wicked, We Will Rock You at the Dominion and Dreamboats and Petticoats. Gian Marco Schiaretti will play Che. Schiaretti played the title role in the Disney musical Tarzan in Stuttgart. The full cast includes Oscar Balmaseda, Sarah O'Connor, George Arvidson, Lewis Barnshaw, Jessica Ellen, Callum Fitzgerald, Kellie Gnauck, Dominic Adam Griffin, Joe McCourt, Jude Neill, Jordan Oliver, Chrissie Perkins, Oliver Slade, Matias Stegmann and Yuval Zoref.